Flooding is a significant problem in the United Kingdom. There are four main forms of flooding, all of which the UK experienced during a two-month period last year; these include groundwater (when the earth becomes saturated and cannot retain any more water), fluvial (when the banks of a river break), flash (when drainage systems cannot cope with surface-level water), and finally tidal (flooding from tidal rivers and the sea). This natural disaster is particularly common in England; currently, more than five million English properties are at risk of flooding. Firms like Hamilton King Management, whose business information is available here, are perhaps more aware of this issue than most, as these kind of companies often provide buildings and contents insurance for the properties they manage, and are regularly tasked with initiating claims on behalf of those whose homes have been damaged by floods. The most problematic aspect of this particular type of natural disaster is the cost associated with managing flood risk and dealing with the aftermath of it. On average, these two expenses cost the UK about £2.2 billion annually; approximately £1.4 million of this is allocated to damages, with the remaining £800 million being spent on coastal and flood defences. Furthermore, the level of flood protection we currently have can only be maintained over the next two decades if the government’s spending on flood defences increases by £10-£30 million each year. By 2080, the total amount spent on flooding could rise to £27 billion. In a bid to address the expense of flood damage, the government has announced plans to launch an initiative called ‘Flood Re’. 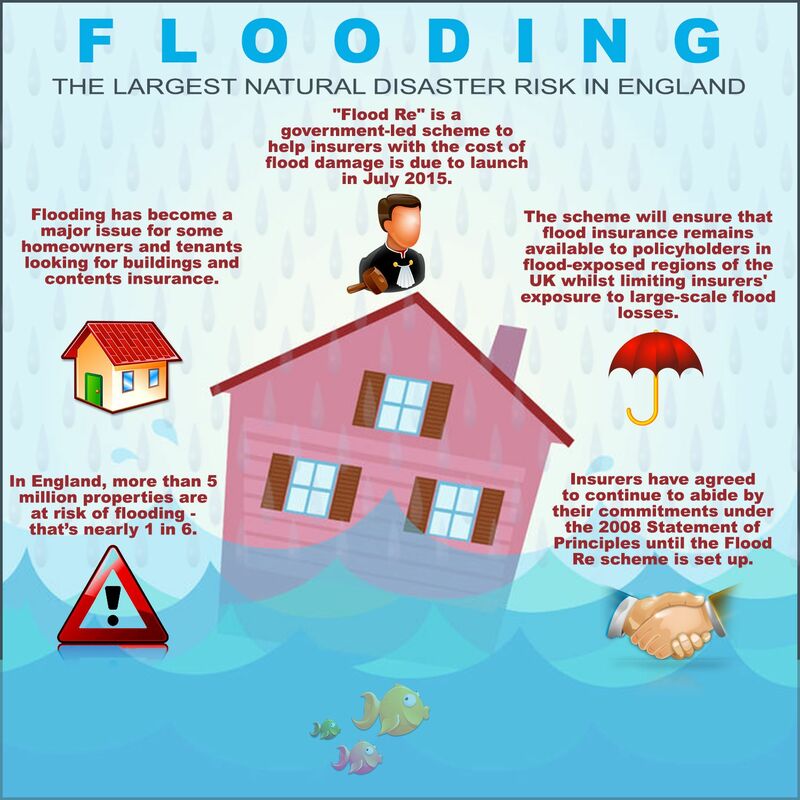 Flood Re was first recommended by the insurance industry in 2011, with insurers declaring it to be the best long-term solution to the current problems associated with flood insurance. After much debate, an agreement between the Government and the industry was reached two years later. When launched, it will operate as a not-for-profit, and serve as a reinsurance fund which will be both managed and owned by the insurance industry. The purpose of this fund is to ensure that residential properties located in the areas of the UK which are most prone to flooding will be able to secure reasonably-priced flood insurance, as part of their buildings and contents policies. Additionally, it is hoped that Flood Re will also help insurers, by protecting themselves from large scale losses during natural disasters. Under this initiative, insurance companies will continue to sell policies in much the same way as before, with one significant difference; they’ll have an incentive to attract customers living in high-risk flood areas, as these households will be able to pass the policy’s flood component, and thus be accepted into Flood Re. Home insurance policies’ flood elements will be included in this initiative based on the Council tax band that a property falls under, and will then be priced accordingly. However, it will not be made available to houses in the Council Tax Band H. Additionally, properties which were first sold after the 1st of January 2009 will not be able to avail of the benefits of Flood Re, as the Government does not want to incentivise housing developments in high risk locations. It has been estimated that approximately 350,000 homes – which would previously have struggled to obtain flood insurance – will be considered eligible for this scheme. This will mean that high-risk properties will be able to return to a competitive open market, as the insurer of such houses will be given the option to use Flood Re as part of a customer’s policy; this in turn would transfer the premium income, along with the risk, to this initiative, meaning that the insurer would have no reason to refuse cover to a customer living in a flood-prone area. Those living in these places will also be able to enjoy cheaper policies, as Flood Re permits insurance companies to cede a policy at a specific price, which has been deemed by both the Government and the industry to be an affordable amount. Flood Re will be officially launched in July of this year; until then, insurers will continue to adhere to the commitments which they made under the Statement of Principles in 2008. This agreement features a number of protective measures, including making sure that new developments in high risk areas are flood-resistant, and that planning systems are in place to prevent property developers from building houses in flood-prone locations. Although the scheme does have its detractors, there’s no question that most of those living in high risk areas will welcome Flood Re with open arms. However, only time will tell whether this government initiative will live up to the hype, and help to tackle the current flood insurance issues which have affected so many UK households.